International Space Station crewmembers will be free to watch the Super Bowl this Sunday. When the Carolina Panthers and Denver Broncos square off Sunday, astronauts on the International Space Station will be able to watch the kickoff in real time. In fact, the crewmembers have more in common with the football players they're watching than one might realize. For one thing, the outstretched arms of the International Space Station where the astronauts reside are about the length and width of a football field. For another, NASA pioneered the shock-absorbing foam, shiny outside shell and wireless communications found in football helmets. Including its solar arrays, the International Space Station's length and width is about the size of a football field. Plus, in 2010, the coin flipped to start the big game had flown in space on the space shuttle Atlantis for 11 days, racking up 4 million miles (6.4 million kilometers) around the Earth. 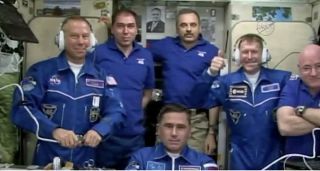 After their day off, the crewmembers will return to their experiments on the space station. Kelly and cosmonaut Mikhail Kornienko are within four weeks of the end of their yearlong mission, and the two are currently joined by Kopra, British astronaut Tim Peake, and cosmonauts Yuri Malenchenko and Sergey Volkov (who just completed a spacewalk Wednesday, Feb. 3).